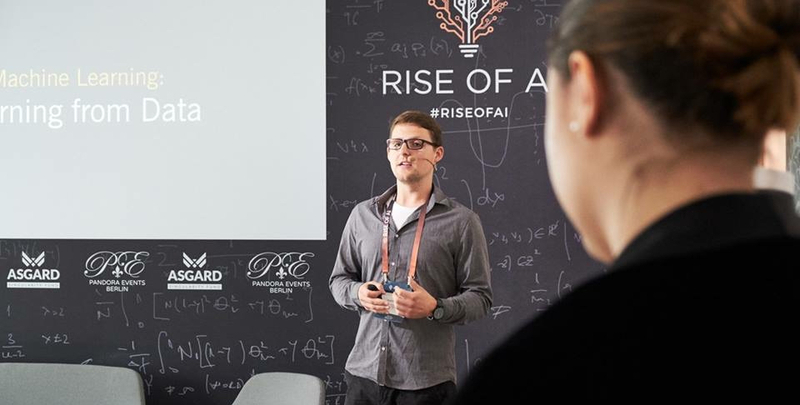 On May 17th, I attended the 4th Rise of AI conference in Berlin. The conference grew from 17 participants in 2015 to 70 in 2016, 300 in 2017, and this year 700. Although many more interested people wanted to participate, the event organisators, Veronika and Fabian Westerheide, announced that the conference next year will be capped at around the same amount of people to not loose the personal touch – in my opinion, a very good decision. I had the chance to give a presentation on my own. I talked about my team’s learnings with regards to the data science process, the obstacles we faced and still facing, and the concepts & solutions we have been developing to get around those issues and to make the data science process smoother. I am super happy with the very positive feedback and interesting discussions I had with other attendees and that I was able to validate whether or not my team is on the right track with our approach. The conference was opened by Fabian, who published a report co-authored with Roland Berger showing a list of AI startups around the world. He stated that the intention of founding the conference was to create an AI-awareness and ecosystem in Europe to be able to compete with the US and China and, hopefully, winning the AI race. It is worth to be mentioned that London is the city with the most AI-companies in Europe currently. The conference had three stages: The AI Future Stage, the Applied AI Stage, and the Startup & Research Stage. The AI Future Stage had an impressive lineup of popular people, such as the engineer Kevin Warwick, who is known for putting implants into his body and doing research with it, Ben Goertzel, who amongst other things is the creator of the first-robotic citizen Sophia, and the sci-fi author Daniel Jeffries. Jeffries gave his talk directly after Goertzel and their different perspectives became clear from beginning on. Goertzel presented himself as being very optimistic that Artificial General Intelligence (AGI) is not too far away (just 9 years from now instead of 10 years as he predicted 10 years ago 😉) and Jeffries stated that we cannot foresee it as there are no indications how we should get there. Jeffries also expressed his worries about dumb people using Artifical Narrow AI (ANI) rather than being scared of an AGI that decides to kill us all. Goertzel is convinced that, if we create the right environment, we humans can have a profoundly good experience with AI and robots, with using human-like embodiment of AI to help building trust. Interestingly, in Goertzel’s point of view the next years will not be so much about new breakthroughs but about putting the stuff we have together, with situational awareness of AI / robots as an example. State secretary Christian Rickerts also took stage and gave a speech about his excitement in the current development, the efforts of the conference addressing a lot of issues, including ethical, legal, and infrastructure ones, the fact that every eight job is created in the tech industry and, of course as being in the role of the Secretary, that Berlin is the best place to be. The other two stages were the Applied AI Stage and the Startup & Research Stage, where companies and startups had the chance to present and discuss what they are doing with regards to AI, machine learning, and data science. VCs shared their opinions about the most interesting fields these days including automation, digitalized coaches that help to improve you (as Grammarly is there to improve your writing skills), computer vision for healthcare, and manufacturing / predictive maintenance as there is the potential for huge value creation. In general, they said that the most important part to invest in is the team itself, with keeping an eye on how close the team is to research & innovation and what the credibility of the team is with focus on how well they are networked and whether they do what they claim they can do. In the past, I had the luck to talk to other funding firms / accelerators and the shared message is: They mainly invest in teams, not in fixed ideas. The Director of Product & Technology, Dominique Ziegelmayer, spoke about how ML systems should consider different aspects of a user’s behavior to make better sales decisions. The example he gave us was about him wanting to order something using Amazon Alexa. When Alexa suggested a product, she took his order history into account, but not his written feedback, which resulted in a not-made sale because of a poor product suggestion. Holger Weiss,the CEO of German Autolabs, talked about the aspects of having a conversational assistant in a car and how it should develop from a simple voice to a really enjoyable and helpful co-driver. Examples of intelligent behavior he gave included that the assistant should not talk in situations of high focus, for example when the driver is switching lines or is taking an exit. To be honest, in a lot of fields where conversational interfaces / chatbots are presented at the moment, I am rather skeptical, because I skim a well-prepared website containing information or use a well-structured UI usually much faster than interacting over a conversational interface / chatbot. Voice assistants as a form of a conversational interface, on the other hand, make a lot of sense, especially in environments where your alternatives to voice and listening is quite limited as it is in cars. 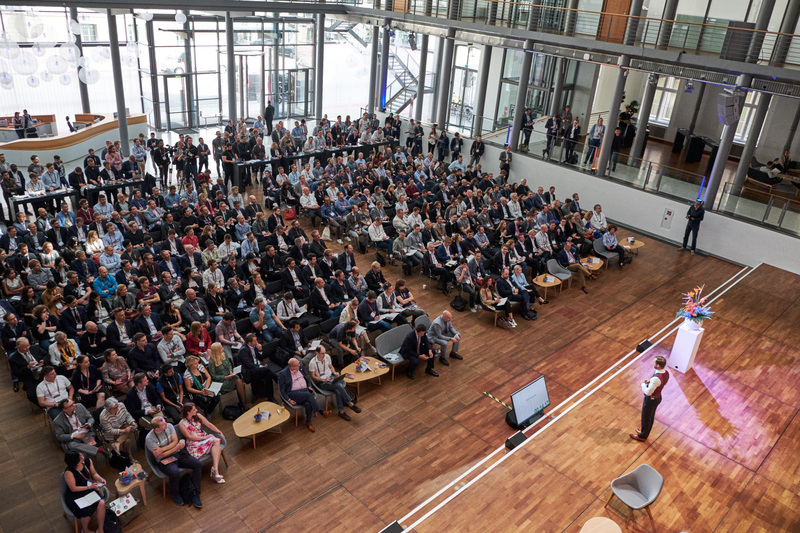 Vice President at Deutsche Telekom, Jan Hofmann, gave a talk about building up their data science efforts at Telekom and what their roadmap is, from using NLP in the field of chatbots to focus on other fields such as smart decision making in the future. How to build an agile team? I had the great chance to have a long conversation with Jan at the conference and discussed with him how to build an agile data science team in a company. He shared with me that his now around 100 people-sized team at Telekom is organized based on Spotify’s approach by using the concept of Squads, Tribes, and Chapters. Here is a Medium article covering the concept and a Whitepaper. Besides this organization or because of it, they work in a heavily distributed way where they are using Slack and created their own meeting culture. As soon as there is only one single remote colleague in a meeting, no meeting room is used at all and every participant joins in remotely so that all information is shared equally without side-discussions in a meeting room or similar. This is supposed to prevent people feeling like second-class attendees, but a drawback he mentioned is that there is less fun in meetings – so, it is a never-ending learning curve about how to make meetings better. They try to structure meetings in such a way that those points come first where everybody is needed. As a result, those can leave the meeting who not further need to attend. This, of course, requires a culture where it is okay to leave a meeting as soon as you don’t see any more value in it. In status syncs, participants are also limited to their one or two most crucial points they can speak about. Hence, they have to think and filter in advance to a meeting. Related to this well preparedness, I asked about Jan’s opinion of the Amazon approach floating around recently at Twitter. In that approach, no presentations are used but instead short written essays and meetings are structured into a reading, discussion, and conclusion phase. To my delight, he did not only share his opinion but knows an executive at Amazon and was able to share the executive’s experience with me as well: this approach takes a lot of effort as it requires a lot of preparation time and, thus, results in sleepless nights, but he absolutely loves it because the standard and quality of meetings have increased dramatically. Another interesting aspect was that projects are partially run in a VC-funded style. Hence, the manager interacts as a stakeholder and not as the person involved in every decision with the need to permanently report. This gives the teams the freedom to execute with high focus. Trying out such ideas and being really productive with it definitely requires some time and also a shift of mindsets and evolving of culture. Of course, this is a really drastic step, but sometimes it is just good to know about other approaches and think about them even if you don’t want to adapt them. With regards to the work in the ML field itself, we discussed the importance of going for low hanging fruits where you can quite quickly create positive impact, whilst it is also important to do things in a sustainable way. Interestingly, they started to work on knowledge graphs some time ago to back their chatbots up with easy-accessible knowledge. Of course, I liked that part very much as our work on the Enterprise Knowledge Graph has the same motivation in mind. All in all, this was a great conference day I enjoyed much, not only because my chance to take the stage myself, but also because the high quality of speakers (content and way of presenting), the great venue, food and drinks, and the super networking experience, of which I only picked one to share with you. I am super excited about the growing efforts of machine learning in Europe and personally am quite optimistic about the future of humanity.